Governor-General, His Excellency the Most Hon. Sir Patrick Allen, places a wreath at the shrine of National Hero, the Rt. 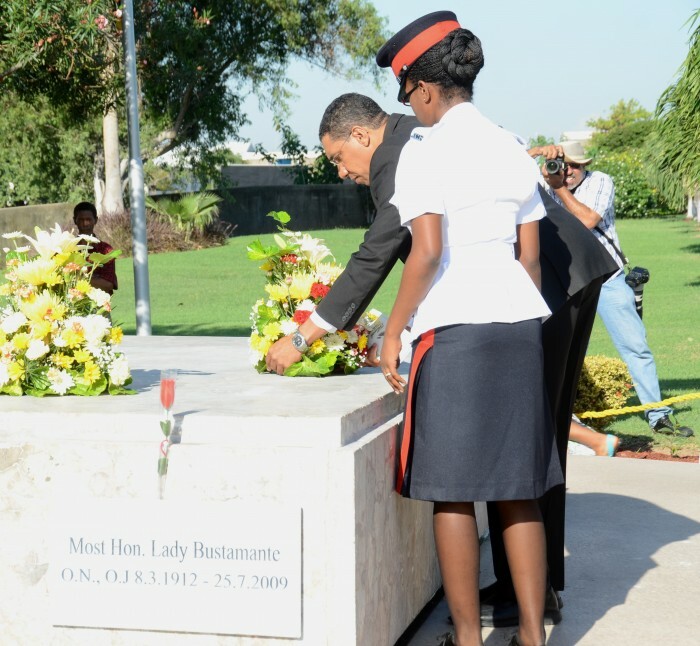 Excellent Sir Alexander Bustamante, in honour of the 132nd anniversary of his birth, during a floral tribute at National Heroes Park, in Kingston, on Wednesday, February 24. On the 132nd anniversary of his birth, National Hero, the Rt. Excellent Sir Alexander Bustamante, is being remembered for his tireless advocacy for the rights of the Jamaican people. Several dignitaries gathered at his shrine in National Heroes Park, on Wednesday, February 24, to participate in a floral tribute to the National Hero. “Sir Alexander was ahead of his time in factoring an experience of the wider world as part of his preparation to lead his country into the community of nations. Equally, we can be in no doubt that Jamaica was his home, his central focus and the arena in which he would demonstrate his passion for service,” he said. Governor-General, His Excellency the Most Hon. Sr. Patrick Allen, headed the list of persons who laid wreaths at the shrine. Others were Leader of the Opposition, Mr. Andrew Holness; Minister of Education, Hon. Rev. Ronald Thwaites, who represented Prime Minister, the Most Hon. Portia Simpson Miller; President of the Bustamante Industrial Trade Union, Kavan Gayle; and Dean of the Diplomatic Corps, His Exellency Jose Tomas Ares German. Sir Alexander Bustamante was born William Alexander Clarke on February 24, 1884, in Blenheim, Hanover. Considered one of the founding fathers of modern Jamaica, he was passionate about people and their welfare, particularly the poor working class and was a vanguard for human rights and national development. Sir Alexander Bustamante became the champion of the working class when he advocated their cause during 1937 and 1938, a period of major social unrest. In 1943 he founded the Jamaica Labour Party (JLP), which he headed. The first general election under Universal Adult Suffrage was held in 1944 and the JLP won 22 of the 32 seats. Sir Alexander Bustamante became the first Prime Minister of Independent Jamaica in 1962. He retired from active politics in 1967. In 1969, he was made a National Hero, the only Jamaican to receive this honour while still alive. He died on August 6, 1977, at the age of 93. A civic ceremony was also held at Sir Alexander’s birthplace today. Minister of Education, Hon. Rev. Ronald Thwaites, lays a wreath at the shrine of National Hero, the Rt. Excellent Sir Alexander Bustamante, in honour of the 132nd anniversary of his birth, during a floral tribute at National Heroes Park, in Kingston, today (February 24). Rev. Thwaites represented Prime Minister, the Most Hon. Portia Simpson Miller. Leader of the Opposition, Andrew Holness (right), places a wreath at the shrine of National Hero, the Rt. Excellent Sir Alexander Bustamante, in honour of the 132nd anniversary of his birth, during a floral tribute at National Heroes Park, in Kingston, today (February 24). Observing is Constable Shaneika Murray-Bartley. Dean of the Diplomatic Corps, His Excellency Jose Tomas Ares German, lays a wreath at the shrine of National Hero, the Rt. Excellent Sir Alexander Bustamante, in honour of the 132nd anniversary of his birth, during a floral tribute at National Heroes Park, in Kingston, today (February 24).